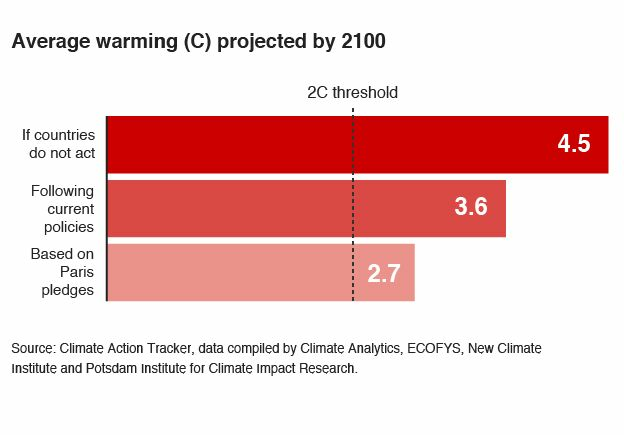 The agreement includes a commitment to keep the rise in global temperatures "well below" 2 C compared to pre-industrial times, while striving to limit them even more, to 1.5 degrees. Scientists consider 2 C the threshold to limit potentially catastrophic climate change. It's the world's first comprehensive climate agreement, with all countries expected to pitch in. The previous emissions treaty, the 1997 Kyoto Protocol, only included rich countries.​ Canada signed on to Kyoto, but later backed out in 2011. The deal also calls on developed nations to give $100 billion annually to developing countries by 2020. This would help these poorer countries combat climate change and foster greener economies. The agreement promotes universal access to sustainable energy in developing countries, particularly in Africa. It says this can be accomplished through greater use of renewable energy. Countries will be tasked with preparing, maintaining and publishing their own greenhouse gas reduction targets. The agreement says these targets should be greater than the current ones and "reflect [the] highest possible amibition." These targets will be reviewed and revised every five years starting in 2023. The agreement also says that each country should strive to drive down their carbon output "as soon as possible." The deal sets the goal of a carbon-neutral world sometime after 2050 but before 2100. This means a commitment to limiting the amount of greenhouse gases emitted by human activity to the levels that trees, soil and oceans can absorb naturally. Scientists believe the world will have to stop emitting greenhouse gases altogether in the next half-century in order to achieve this goal.